Canadian western red cedar is the most popular choice for timber cladding projects in this country. This is simply because the wood is ideal for the job. Cedar originating from the Pacific West coast of North America and Canada grows is almost perfect conditions producing clean and slow grown timber. 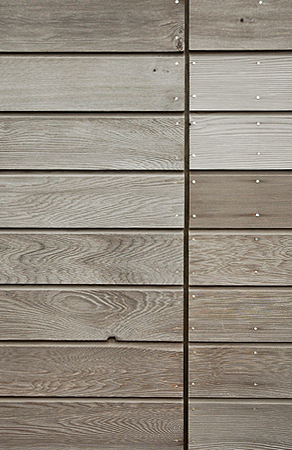 The wood is both naturally durable and relative stable when compared to other wood species commonly used for cladding. These two qualities ensure that cedar cladding boards continue to look smart for many decades. 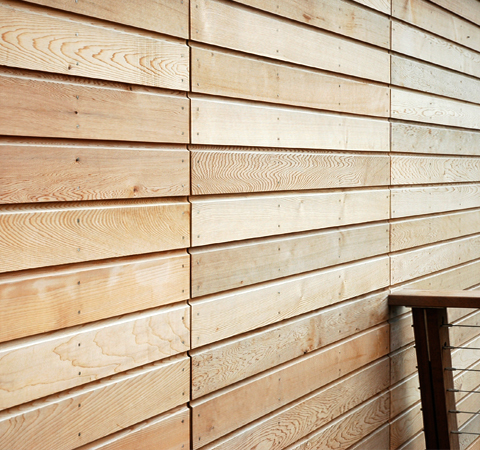 Canadian western red cedar cladding is slow grown compared to our native cedar, resulting in a denser and darker wood. However, it is still a relatively soft timber that bruises more easily than timbers such as larch and oak. For a comparison between Canadian and British grown western red cedar watch our new video. Customers specifying Canadian western red cedar should be aware of the wide colour variation in each batch. In the same pack, the colours can vary from light pink to dark brown. The vibrancy of the colours will fade over time, but the weathering process can be inconsistent and patchy. The Export Grading Rule Book published by the Pacific Lumber Export Bureau classifies two grades for the export of Canadian western red cedar: ‘No 2 Clear & better’ and ‘No 4 Clear’. Although the grades can be bought separately, in the UK the two are commonly blended to produce a grade called No 2 Clear & better / 15% 4ths. This is the grade we offer as standard because we believe it combines quality and value for money. In a typical selection of our Canadian western red cedar, the majority of the boards will be knot free, while the remainder will contain occasional knots. As with all trade grades, there is a lot of variation between supplier mills. However, we make every effort to ensure that the production we receive is among the best on the market. 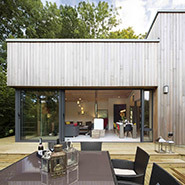 Canadian western red cedar is the most expensive softwood cladding offered by Vastern Timber, although it is considerably cheaper than hardwoods such as oak and sweet chestnut. Canadian cedar is an ideal choice for modern designs where a relatively knot free appearance is desired and for applications where stability is a concern, such as painted cladding. Appearance Canadian western red cedar has a strong, distinctive grain. The colours vary widely from dark chocolate brown to light pink. The boards are relatively free of knots giving a clean and contemporary appearance. Weathering When left untreated, cedar will bleach to a silver colour although the process can be inconsistent and patchy. Northerly elevations may weather to a darker grey than those facing South. Extractives Western red cedar contains reactive oils, which will corrode ferrous metals. When the two come into contact, a blue sludge is formed that will stain the wood and anything else it meets. All fixings used in conjunction with western red cedar should be stainless steel. The oil is brown in colour and could also leave unsightly brown stains on the surface of the cladding and will stain any porous materials below the cladding. The reactivity of the oil makes western red cedar cladding unsuitable for polluted areas and shaded areas.